A conflict near the breaking point. 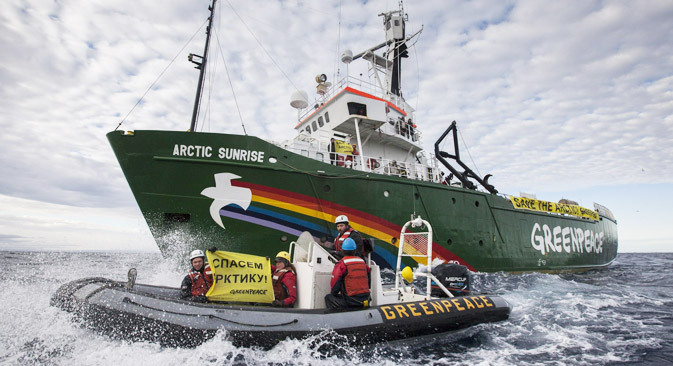 The situation brewing around the Greenpeace ship that approached the Prirazlomnaya Russian oil platform in the Pechora Sea (the southeastern part of the Barents Sea) and the subsequent detention of the crew by the Russian border patrol has become the subject of heated debate. The reasons for the debate are not entirely obvious. First of all, the incident took place in waters that are under Russian jurisdiction. Moreover, the Arctic Sunrise, which the activists used to reach the platform and attempt to board it, served as a base for motor boats and sailed under a Dutch flag, carrying out maneuvers beyond the three-mile zone around the rig. The incident did not cause property damage and none of the people died. However, the crew was charged with piracy. On Tuesday, Sept. 24, Russia's investigative committee opened a case against the Greenpeace environmentalists detained in the Pechora Sea, citing "piracy." Last week, after activists from various countries tried to land on the Prirazlomnaya platform, the icebreaker and the environmentalists onboard were detained and escorted to the port of Murmansk. After arriving in the city, the international crew of the ship was questioned, and, according to sources in the media, sent to a detention center. Under Russian law, piracy is defined as "an attack on a ship or riverboat with the goal of appropriating someone else's property, committed with violence or the threat of violence..." Therefore, the actions of the environmentalists, on the one hand, can be classified as piracy (an attempt to seize property); on the other hand, the object that was attacked cannot be called a ship. The Prirazlomnaya platform is a stationary unit that is attached to the sea floor, and illegal actions against her and her crew must be considered something other than "piracy." According to the Protocol for Combating Unlawful Acts against the Safety of Fixed Platforms on the Continental Shelf, deliberately capturing a fixed platform or establishing control over it by force, or threat of force, or any form of intimidation can be called a crime. Any act of violence against a person on the platform, or even a threat to his security, would also be regarded a crime. It follows from this that Greenpeace activists committed a crime when they tried to land on the platform, and the border guards acted within the law. The law enforcement authorities have the right to extend jurisdiction over the offenders. That is, the statute on "Violating the Laws of the Russian Federation on the Continental Shelf and Exclusive Economic Zone of the Russian Federation" can be applied to the actions of the environmentalists. A foreign ship can legally enter the territorial waters of the Russian Federation only in the case of innocent passage, or if it is headed for one of the Russian ports. That is, if Arctic Sunrise entered Russia's territorial waters, it violated Russia's law "On the State Border of the Russian Federation." If Arctic Sunrise was in the exclusive economic zone of the Russian Federation, the vessel violated the law if it transported slaves, engaged in piracy, illicitly trafficked drugs, made unauthorized broadcasts from the high seas, or destroyed an underwater cable. To prevent these actions — that is, if there are suspicions that piracy might be committed — coast guard ships of the Russian Federation, which serve the government, may be deployed. However, this raises another problem: Based on the 1999 International Convention on Arrest of Ships, the Arctic Sunrise should be released immediately after it provides sufficient security. Consequently, the release now depends only on money. Any release under these conditions does not affect further investigation and is not an acknowledgement of liability or waiver of any defense. —Alexander Skaridov is the dean of the Department of Maritime Law at the Admiral Makarov University of Sea and River Fleets.